It’s called “We the Moral Majority”. It’s a sequel to my 1st book “Amongst the Killing”. It follows some of the characters from the 1st book as Detective Street has been tapped by a growing right wing organization, called the Moral Majority, to run for Mayor of Los Angeles and be part of a movement that is sweeping the country. But, as it is always the case with politics, it becomes about the level of corruption and how deep the bodies are buried. We are told this chapter in Detective Street’s life through the eyes of US Marshal Janelle Panchenko, who made an appearance and an impact in the first book. I will say, though, anyone who knows my style, knows it’s not going to be as cut and dry as that. You will just have to wait to read it to know what I mean. Actually, it comes from the idea that I didn’t do Agent Panchenko justice or write her as well I wanted to in the first book. I am trying to personally challenge myself and continue the story of characters known to my readers. Which I feel is a safe space to take on a challenge of this magnitude. Did you have to research for this novel and if so, why? I am still in the first draft, but yes, there is a lot of research I am doing. I like to write in a realistic space and make the story have that authentic feel. If you did research, what do you think surprised you most to learn and why? Well, so far in the research I have done, it surprised me to find out how Mayors in Los Angeles aren’t allowed to declare a political affiliation or designate a party in their filling for the job. I was surprised by that actually. It was a law enacted in the 70’s to prevent a one party majority as they found if the governor is a certain party, the mayors of the larger cities become easy votes if the party is listed by their names. I think that law has been abolished now, but it was existent when my story takes place. Is your protagonist anything like you personally? Honestly, not really. Besides the obvious, that she is a woman, she is more of the opposite of me, and I should say, better than me. I modeled her after strong women I have met and I put a little of me in it to round her out (in other words give her flaws lol), but I wanted her to be someone I would admire and want my daughter (if I had a daughter) to look at and more importantly look up too. What made you write this character; what made them important to you or made you want to tell their story? I wasn’t happy with how she read. I really felt that, because I was so focused on the main storyline and characters, she was misrepresented a bit. This is my personal feelings, and in looking toward my next challenge writing-wise, I felt this was an opportunity. Is there anything you specific want readers to know about this piece of work? This is a different story than the first one, but it is a sequel because, if you didn’t read the first one, some of the insider info may go past you and not make much sense; but that is easily dismissible. 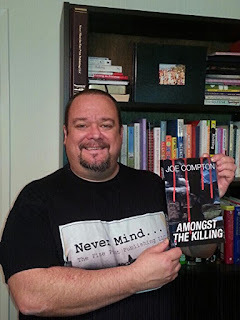 So I would definitely recommend reading “Amongst the Killing”, but know that you don’t have too. When will the novel be available for purchase?